Thank you so much for your awesome newsletters and software. I just wanted to let you know that I recommend your products every chance I get. My co-worker is looking for something to get her dad for a Remarks At Your Funeral gift and she thought it was such a great idea. Let the kids pick out their favorite Christmas candies wrapped in red, green, gold, silver or multi-colors for this fun family activity. 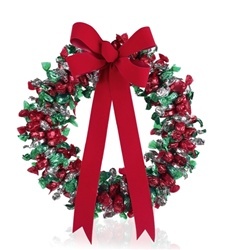 A candy wreath makes a fantastic gift for neighbors. If you are sure to add only 25 pieces to each wreath it is also a tasty way to count down the days until Christmas with a candy a day. Unbend the hanger and cut it in half. Bend the 1/2 hanger into a circle leaving about 4" at the top to make a hook. Twist the end to make it look like a circle with a hook on it. Cut your curling ribbon into 8" pieces. Fold your ribbon in half. In the middle of that ribbon tie one piece of candy. Tie it on the end of the candy where the paper twists. Now tie the candy with 2 knots tightly on to the hanger. Tie the candy right next to the wire to help cover it up. Use the scissors to curl the ribbon on each end. Repeat the process for all your candy pieces.